Behind the Bit: Modern Morgans: New and improved? Modern Morgans: New and improved? 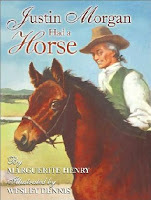 When I was a wee child, I had all of the Marguerite Henry books, including the one with the bay colt on the front: Justin Morgan had a Horse. The original Morgan, Figure, is the stuff of legend, and his origins are shrouded in mystery. Like a lot of great horses that seemed to "spring from nowhere" (e.g., Seabiscuit), experts speculate that in fact he descended from "proto-thoroughbred" bloodlines that were heavily influenced by the Arabian, the North African Barb, and the Spanish Barb. Known for being a sturdy, versatile, attractive animal, the Morgan is one of few horse breeds to originate in the United States. Early in the 20th century the U.S. government became involved in breeding Morgans for use as cavalry horses. One of the government foundation stallions is the bay General Gates (pictured to the right). He is the how I imagine the original Morgan Figure looked, and the way the Morgan breed in general is described in the horse breed books I thumbed through endlessly as a child. The American Morgan Horse Association (AMHA) describes the Morgan as a horse with "small ears set above a broad forehead with large, kind eyes, tapered muzzle and expressive nostrils, an arched neck set on a well angled shoulder, broad chest, short back; deep, compact bodies set on legs with flat, dense bone; round croup, and round, hard hooves. Their proud bearing gives them a distinctive beauty that catches the eye of all." Pictured left is an admittedly lovely park-type horse--but it doesn't look like a Morgan! 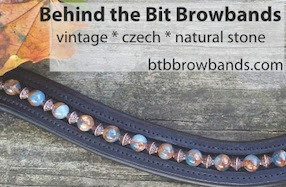 According to the Foundation Morgan Horse web site, breeders began introducing Saddlebred blood in their breeding programs in the 1930's in an effort to transition the breed from a farm/work horse to a riding horse. It seems as if it was an effort to make the Morgan marketable and to capitalize on "the popularity of the Saddlebred and the prestige they brought in the show ring." This practice resulted in Morgans which were less and less of classic Morgan type. More than 50% of the Morgans living today carry a good bit of Saddlebred blood. While I love Saddlebreds, I tend to think Morgan breeders could breed for the qualities of a riding horse while preserving the traits that make the Morgan unique. A number of Morgan breeding farms have chosen to focus their efforts on preserving the original/traditional morgan type. There are several foundation Morgan societies/organizations listed below. Exhibit A: I boarded Riley briefly at a barn that also boarded some show Morgan mares. These park horse types showed aggressive behavior toward other horses and they had no respect for humans. They were frankly dangerous. Bob and I had to go through their pasture to get to Riley's pasture and I always carried a whip. The barn owner who boarded them was no fan. Her most memorable comment was "if all horses were like these Morgans, I would not be in the horse business." Exhibit B: At another boarding facility (where I once kept Harv), two boarders with their show Morgans were asked to leave the farm. Their horses were "little beavers," not only chewing wood but stripping it from the walls. They were on regular turnout but they had to wear kick chains when stalled. One was so fractious she could not be ridden outside of an arena. In the end the barn owner decided they were too much trouble. Exhibit C: My dear friend Linda has an aged "old style" Morgan. Her cresty necked liver chestnut gelding is formerly a horse-for-hire at the Claremont Riding Academy in NYC. His character exemplifies the ideal -- well, maybe he's a little too clever for his own good :-). Sportmorgan.com provides more information about Morgans as athletes. Check out Laughter's Lord Wilson, an example of a dressage sport horse that has the traits and characteristics that make him identifiable as a Morgan. For the visually oriented, here are videos. Silverymoon stables "About the Morgan"
Good topic! Thanks for posting one so close to my heart! I completely agree with you. I admit I'm not a fan of the newer park-horse Morgans. They look like Arabs or Saddlebreds, which is OK for a real Arab or Saddlebred. But I think that the old Morgan type has qualities that should be preserved and promoted. My little Armani is half-Morgan (and half Trakehner). His father is the old government line. I've known a few old-type Morgans and have been a big fan ever since. He is smart (too smart? ), hardy (never sick, never a lame step), so friendly, comfortable, and compact. I call him "my little Ferrari". There are a lot of successful dressage Morgans up here in Vermont. They've got great heart and versatility. I didn't know Armani was part morgan -- I'm not usually a fan of crossing breeds (friesian arab, morgan arab, draft TB) but I think morgans should cross well with warmbloods and maybe tbs. I don't think the video link is working but I love the morgan TB cross on google video (will try to get it again. Admittedly my experience with Morgans in general has been literary rather than in-person, but I'm appalled that the Saddlebred was chosen as the breed to "cross" with Morgans to create a "better saddle horse". I truly don't understand what the issue is with the breeds you've listed as being contributors to the Morgan type -- Arabs, Barbs -- those are great saddle horses and possess many other wonderful qualities as well. If it was the "smoothness" of the Saddlebred that was the goal, my suggestion would be to incorporate Paso Fino to achieve that. You would stick with the "type" and the great temperament of the original Morgan while getting a very smooth riding animal. Great article on a breed that's not as well known as it should be. You caught me with the reference to the Marguerite Henry books. I read all of them over and over and over. I think it's time to introduce them to my daughter. My first horse was a foundation-type Morgan, and I swear he did just about everything described in Justin Morgan had a Horse! He chased dogs, rode, drove, and outsmarted me on a regular basis. He wasn't an easy personality to get along with all the time, but he was one of the most athletic horses I've ever known. at one of the barns where I rode growing up, there was a Morgan of the old style. What a great horse! He was friendly, calm, and smart. I didn't realize Morgans had gotten a bad name (I don't know anyone who has one -- which I guess should have been a clue! ), and I was very surprised to see the 'park horse' photo -- that doesn't look like a Morgan to me at all! Excellent post! I have long been a fan of classic Morgans. I rode them as a child, and they will always be the epitome of equine beauty to me. I don't understand the wish to turn Morgans into Saddlebreds any more than I understand trying to turn TWH into Saddlebreds, which also happened about the same time. I guess it was all about money, Back then, Saddlebred show horses were bringing in the money. Hopefully now, with top Dressage and Event horses bringing in the big bucks and prestige, the Classic Style Morgan will come back into it's own. I have had a lot of experience with Morgans, and part-morgans, and they are all athletic and scary smart! Yep, very smart... I have been riding 2 old type morgans for a year and a half now. They are lovely horses. They eat the wood of their stall like crazy but beside that, they are really great horses. Not easy under saddle though, if you start to ask them to work. But they are very willing to do whatever you want them to do. The other is a dark bay mare. Dressage oriented, very very pretty. I wished I had the time (and money) to show her in some dressage shows, but these two girls are not mine, and I have a filly I have to take care of). These are the first morgans I have ever known and I love them very much. I think we've all read the Justin Morgan book. I'm wondering why they would take such a beautiful animal like a Morgan and cross it with a Saddlebred to get a different type of riding horse. I'm not opposed to Saddlebreds but I say leave the Morgan the way he was meant to be, instead of trying to improve on a nearly perfect horse. Leave well enough alone I always say. Good post. I moved to Indiana 23 years ago to remarry. My new husband talked a lot about Morgan horses. He had farmed with horses and had had a buggy horse that was part Morgan. We ended up buying a 4 year old old fashioned Morgan named Lady Elizabeth. I called her Lady E. She was the coolest horse. I'd been out of horses for 15 years, since a teenager. I had 3 young children, but that was the beginning of renewing my love affair with horses. I have never known a smarter horse, a cooler horse than she. She was the old fashioned kind, and you could trot on her all day long. We went to the big midwest Morgan horse show in Indiana. I'd never seen park horses before and was shocked at what I saw. One memory that stands out is a lady taking her horse to be longed, and that horse's head was cranked in as tight as it would go with side reins. I'll never forget the look of terror in that horse's eye. We had to leave Indiana and sell Lady E. She would be 27 now. I wonder if she's still alive. She taught me that you could have a personal relationship with a horse. Interesting topic. The trainer I had in the 90s had gone to Germany for her bronze medal, said the Germans did not discriminate against any breed of horse for dressage or jumping. If they had the ability then they were trained and shown. When I had my first horse boarded at stable, there were several other boarders who had Morgans that looked like the foundation stock. Morgans are very nice horses, it's too bad I haven't seen them in the Toronto area of late. Thanks for the link to Bridlepath, and for also taking a stance against the "new and unimproved" Morgan. It's heartbreaking to look at how little of the original blood is left. If you want a Saddlebred, fine, fill your boots; don't turn one breed into another. Saddleseat is way too "nichey" and all the emphasis on park/pleasure-type horses just turns people away from Morgans when they can do so much more. It really is tearing the breed apart, sadly, though I'm glad to see people are waking up and realizing how valuable that old (no UPD) blood is. I've been skimming through your blog, and I really love it! As a Morgan owner, this post *though it is old* really piqued my interest. While there are the showy type morgans that are bred to be higher headed and more high stepping, I hope you will find that there are still many many many curvy, baroque type "old Fashioned" looking Morgans in the show ring as well. Morgens excel in western pleasure, reining, jumping, hunter seat, dressage, eventing, endurance, carriage, etc. I also note that there are quite a few different styles being bred, depending on what you're looking for. In fact, size and the Morgan Sporthorse type are gaining quite a bit of pupularity in the Morgan world. I stumbled upon this article. I have a Morgan, and unfortunately, he has one saddlebred (I don't care for saddlebreds) - 7 generations back. However his temperament is not at all malicious. He is extremely reactive to his environment, but I account for that between both his temperament and his high sense of observation and intelligence. He's also quite loyal and extremely fast learner and willing working horse. I believe part of the problem is as usual, poor selection in breeding, and how they are trained early on. The breeder I bought my guy from has been doing it for over 40 years. She does not allow her horses - stallions, babies - anything to ever lack any sense of good manners. She has trained horses for riding, driving, etc., and has raised her "babies" to be gentle, caring and above all- well mannered - including her stallions. For any who want the old-fashioned Morgan horse (truly old-fashioned), check out Quietude Stud - old Lambert Morgans - as far as I know, the only ones left. If I had known about them when I searched for my horse 10 years ago, I certainly would have gone there and looked. You often read about the Lippitt line, not much said about the Lambert line. I believe these Morgans are the ones you really want to look at, and if I could afford another horse, I'd grab one. If you want something like a Morgan, but don't want some of the issues from the current breed, you may want to consider a Canadian (breed). I was told Canadians were also bred into the original Morgan, but not many "Morgan" folks want to acknowledge that. After seeing the Canadian breed, I can definitely see how they could've contributed to the old morgan - type, durability, work ethic, intelligence, etc. I have owned and loved Saddlebreds my entire life. Down the road from my farm years ago was a vet who owned and raised Morgans and they NEVER had anything in common with Saddlebreds. This was fine with me. It's like owning a truck or a sedan. They are 2 different looks and totally exectable. I don't understand why they have to change the Morgan to a saddlebred. If you like the look of a Saddlebred then buy one. If not stay with the breed you have. Is it any different then all these designer dogs today?